While I was sitting in my office working this morning I received a message from our security personnel advising all employees to use caution if exiting the building around 1:00pm because many of the streets in the Downtown area would be shut down by the police for a large group of people. However, the message simply urged caution. It contained no specific information or explanation of what was going to be happening. So naturally I was curious enough to schedule today’s lunchtime bike ride for the same time so I could go out and see first hand what was going on. It turned out to be the Iran Freedom March, an annual protest in which Iranian-Americans march down Pennsylvania Avenue, from 10th Street to Freedom Plaza, where members and supporters of the Organization of Iranian American Communities gather for speeches and to draw attention to their call for a regime change in Tehran and ask the U.S. They then finish by marching the last couple of blocks to The White House, where they call on the U.S. government to label Iran’s military and intelligence agency as terror organizations. The group seeks an uprising in Iran and regime change to establish a democratic, secular and non-nuclear nation. It wasn’t the way I planned to spend my lunchtime today. But those plans can wait until next week. I’m glad I was able to observe the march, and learn more about their cause. 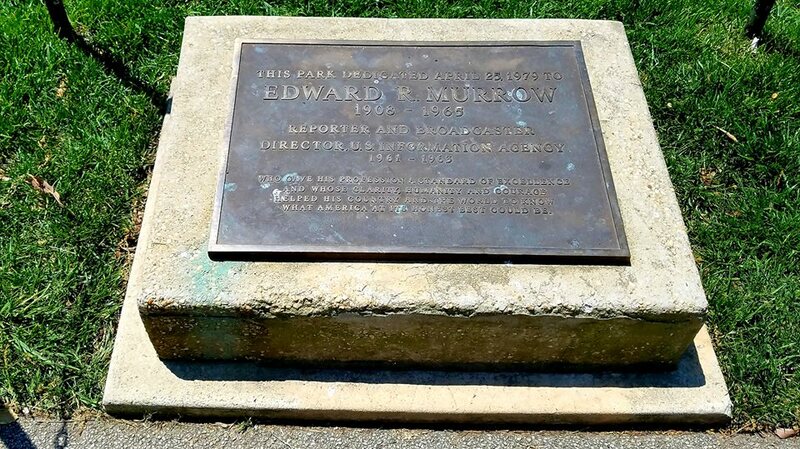 The late Edward R. Murrow was the first journalist to have Federal parkland named after him, when a tiny triangle of land on Pennsylvania Avenue just west of The White House was dedicated to him almost 40 years ago. And during today’s lunchtime bike ride I stopped by the park to see it. Located on Pennsylvania Avenue between 18th and 19th Streets (MAP) in northwest D.C.’s Downtown district, it is just opposite the former U.S. Information Agency (USIA), which Murrow headed from 1961 to 1963. 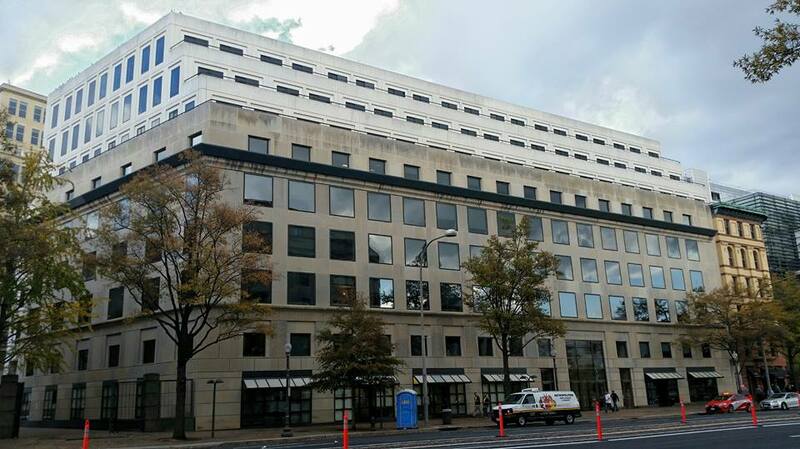 The USIA’s successor, the International Communication Agency, is now headquartered in the same building at 1776 Pennsylvania Avenue. Edward R. Murrow was born Egbert Roscoe Murrow at Polecat Creek, North Carolina in April of 1908. He was the youngest of three brothers born to Quaker parents. When Murrow was six years old, his family moved across the country to Skagit County in western Washington, just 30 miles south of the U.S.-Canada border. He attended high school in nearby Edison, excelled on the debate team, and was president of the student body in his senior year. After graduation from high school, Murrow enrolled at Washington State College, where he was also active in college politics. After earning his bachelor’s degree in 1930, he moved back east to New York. It was in New York that Murrow joined the Columbia Broadcasting System (CBS) as director of talks and education in 1935, and remained with the network for his entire career. He first gained prominence as a broadcast journalist and war correspondent during World War II with a series of live radio broadcasts from Europe for the news division of the CBS. During the war he recruited and worked closely with a team of war correspondents who came to be known as the Murrow Boys. A pioneer of radio and television news broadcasting, Murrow produced a series of reports on his television program See It Now which helped lead to the censure of Senator Joseph McCarthy. Fellow journalists Eric Sevareid, Ed Bliss, Bill Downs, Dan Rather, and Alexander Kendrick consider Murrow one of journalism’s greatest figures, noting his honesty and integrity in delivering the news. Regardless of your political persuasion, most people can agree that we could use a lot more honesty and integrity in our current news reporting. I guess you could say that society needs another Edward R. Murrow. Unfortunately, there was only one. Unlike when most presidents’ terms in office conclude, when President Obama left The White House in January of 2017 he and his family chose to stay here in D.C. In fact, the only other former President to live in D.C. after leaving the presidency was Woodrow Wilson, who also has the distinction of being the only former president interred in D.C. So after living at 1600 Pennsylvania Avenue for eight years, what kind of home did the Obama family move into? On today’s lunchtime bike ride I stopped by to see their current home, located at 2446 Belmont Road (MAP) in northwest D.C.’s Kalorama neighborhood, to find out. While not as impressive as the White House, the Obama family’s current home is newer than it. The White House has been the residence of every U.S. President since John Adams in 1800. The Obamas’ Belmont Road house was built 128 years later, in 1928. The White House has 132 rooms, 35 bathrooms and 6 levels in the residence, while the Obamas’ current house has 13 rooms, eight and a half bathrooms, and three levels. The Obama family’s previous residence has 35 fireplaces, while their current home has only one. The White House has formal gardens, vegetable gardens and a rose garden. Their new home has only a formal garden. Lastly, the White House is approximately 55,000 square feet and sits on 784,080 square feet of fenced in land, while the Belmont Road house is 6,441 square feet and sits on fenced in lot that measures 11,915 square feet. The White House also has a bowling alley, a swimming pool, a tennis court, a movie theater, three elevators, butlers and personal assistants, groundskeepers, and five full-time chefs. The Obamas do not yet have a pool but recently were approved for a permit to build one. And the Belmont Road house has a lower level au-pair suite for Barack’s mother-in-law. Although not for sale, the White House is worth $397.9 million. The Belmont Road house was listed for $5,750,000 in 2008, and then listed and relisted twice in 2012 for $7,995,000. Having not found a buyer, it was subsequently listed again in 2014 for $5,750,000. It sold in may of that year for $5,295,000 to former Clinton White House press secretary Joe Lockhart and his wife, Giovanna Gray Lockhart. An Obama family corporation, Homefront Holdings, LLC., then purchased the home from them in 2017 for $8.1 million, which is more than quadruple the price of comparable real estate listings in the area, where the median price is $1,995,000. Despite the fact that last year’s move from their home at 1600 Pennsylvania Avenue was a substantial step down for Barack, Michelle, and Sasha, their current home is much larger and more valuable than the home they still own at 5046 South Greenwood Avenue in south side Chicago’s Kenwood neighborhood, where they lived prior to the White House, and still stay on some visits back home to Chicago. The Obamas will most likely remain in their current home in the nation’s capital until at least the summer of 2019, after Sasha graduates. After that, they may continue to reside here, they may return to Chicago, or they may end up somewhere else. NOTE: Unlike all of the other photos on this blog, I did not take the above photos of the Obama family’s current home. Those photos were taken from the real estate listing at the time they bought the home. Because the Secret Service, which guards the former president’s homes here in D.C. and in Chicago have restricted access to the roads on which they are located, the following photos were the only ones I was able to take of what I could see on my bike ride. They show uniformed Secret Service officers at blockades at either end of the road, and one of the black SUVs I saw while I was riding around the neighborhood in which sat plain clothes Secret Service agents. On a recent lunchtime bike ride I found myself at the United States Navy Memorial, located on Pennsylvania Avenue, Northwest, between 7th and 9th Streets in Downtown D.C. I have been to this memorial a number of times, but this was the first time I noticed a small brass plaque located on one of the masts that encircles the memorial. So, naturally, I had to check it out and find out more about it. It turned out that the plaque marks the spot where a time capsule was placed in the base of the mast nearest to the entrance to the Navy Memorial Heritage Center. Created by and dedicated to the Navy’s chief petty officers (CPOs), the time capsule was placed there on October 13, 1993, the 100th anniversary of the U.S. Navy’s establishment of the CPO position. The time capsule is scheduled to be opened on the bicentennial anniversary of the establishment of the CPO position, on October 19, 2093. And I look forward to being there to see it opened. “The rank of chief petty officer – the senior position among naval enlisted ranks – was established by the Navy Department in 1893. A time capsule was placed within this foundation on 13 October 1993 to be opened in the chiefs’ bicentennial year 2093. It just goes to show you that you should keep your eyes open and be aware of what is around you when you are in D.C. because you never know what you’re going to see. Many people are not aware that eight Nazi saboteurs landed on our country’s shores early during World War II with the intent to commit sabotage. Their names were George John Dasch, Ernst Peter Burger, Herbert Haupt, Heinrich Heinck, Eddie Kerling, Herman Otto Neubauer, Richard Quirin, and Werner Thiel. Even fewer are aware that during this week in 1942, six of those saboteurs were executed here in D.C.
Operation Pastorius was a failed German plan for sabotage inside the U.S. during World War II. The operation was staged in June of 1942 and was to be directed against strategic American homeland targets. In all, eight saboteurs were dropped off near shore by Nazi submarines and were able to make it to the U.S. mainland — four of them near Long Island, New York and the other four near Jacksonville, Florida. After one of them turned himself in, the largest manhunt in the history of the FBI began for the remaining seven. Within nine days, all of the saboteurs were captured. Fearful that a civilian court would be too lenient, President Franklin D. Roosevelt issued Executive Proclamation 2561 on July 2, 1942, creating a military tribunal to prosecute the German agents under a veil of secrecy. Lawyers for the accused attempted to have the case tried in a civilian court but were rebuffed by the U.S. Supreme Court in a case that was later cited as a precedent for trial by military tribunal of any unlawful combatant against the U.S., including those currently being held in the military prison at Guantanamo Bay as part of the War on Terror. The military tribunal took place in July of 1942 in Assembly Hall # 1 on the fifth floor of the U.S. Justice Department building on Pennsylvania Avenue. All eight would-be saboteurs pleaded innocent, denouncing any allegiance to Adolph Hitler or the Third Reich. The prosecution, headed by the U.S. Attorney General, asked for the tribunal, consisting of seven military generals, for the death penalty. All eight Germans were found guilty. Exactly one month later, based on the Presidentially approved recommendation of the military tribunal, six of the eight were executed in the electric chair on the third floor of the D.C. Jail. They were subsequently buried in a potter’s field called Blue Plains in the Anacostia area of D.C. The other two Germans, George John Dasch and Ernst Peter Burger, were sentenced to terms of 30 years to life at hard labor. On today’s bike ride, I went by the U.S. Department of Justice Building where the first military tribunal against an enemy combatant was held. I also rode by the District of Columbia jail, where they were executed in the electric chair on the third floor. I also rode to the Anacostia neighborhood in southeast D.C., where those who were executed were buried in unmarked graves in a potters field. A look at the statistics will show how things have changed dramatically over the past 71 years. During World War II, there were a total of eight enemy combatants charged by the U.S. All eight were tried, convicted and sentenced, and the sentences were carried out. There were only 57 days between June 12th when the Germans first landed on U.S. soil with plans to commit sabotage, until their sentences were carried out and they were executed or began serving their prison sentences on August 8th. By comparison, the statistics for today’s enemy combatants is much different. In the current military tribunal process, the shortest time between initial capture and conviction was five years, three months and the longest time nine years, seven months. To date, 779 detainees have been held at the Guantanamo Bay facility since the War on Terror began after the September 11, 2001 terrorist attacks. Of the 779 detainees, roughly 600 were eventually released without charges, many after being detained for years. The total number of detainees currently remaining at Guantanamo stands at 41, although 5 of the 41 detainees have been approved by the U.S. for release to home or third countries but remain at Guantanamo. There have been 15 children under age 18 who have been held at Guantanamo. Nine Guantanamo detainees have died while in custody, six by suspected suicide. Only seven detainees have been convicted in the War on Terror military tribunals. And of the 41 detainees that currently remain at Guantanamo, 26 have not yet been charged with a crime. Today’s ride reinforced for me how important it is to know what your government has done, and is doing. Above are the FBI mugshot photos for: 1.George John Dasch; 2. Ernst Peter Burger; 3. Herbert Haupt; 4. Heinrich Heinck; 5. Eddie Kerling; 6. Herman Otto Neubauer; 7. Richard Quirin, and; 8. Werner Thiel. Emergency Rally to Stop Sessions and the New Drug War! “Emergency Rally to Stop Sessions & the New Drug War!” That’s the wording of the online notification I saw from the Washington Peace Center, which describes itself as “an anti-racist, grassroots, multi-issue organization working for peace, justice, and non-violent social change in the metropolitan D.C. area.” And as I read through the notification I realized that a protest was scheduled to be held from noon until one o’clock today in front of the Department of Justice Building at 950 Pennsylvania Avenue (MAP) in Downtown D.C. And since that’s just across the street from my office, I decided to check it out during my lunchtime break. Initially billed as a protest of the new Attorney General’s drug enforcement policies, it ended up including people who were there to protest for a variety of additional causes, such as Black Lives Matter, corporate greed, anti-Trump, and other generic issues such as the people holding signs that simply read “Resist.” Protests in D.C. are often entertaining, but ever since the Occupy protests several years ago I think the messages often get diluted in the diversity of causes that show up in addition to the original reason for the protest. Despite this, I’ll continue to show up at them. Being on leave from work for the past several weeks, first for the holidays and then unexpectedly for personal reasons, has made me miss my lunchtime excursions to explore the city. 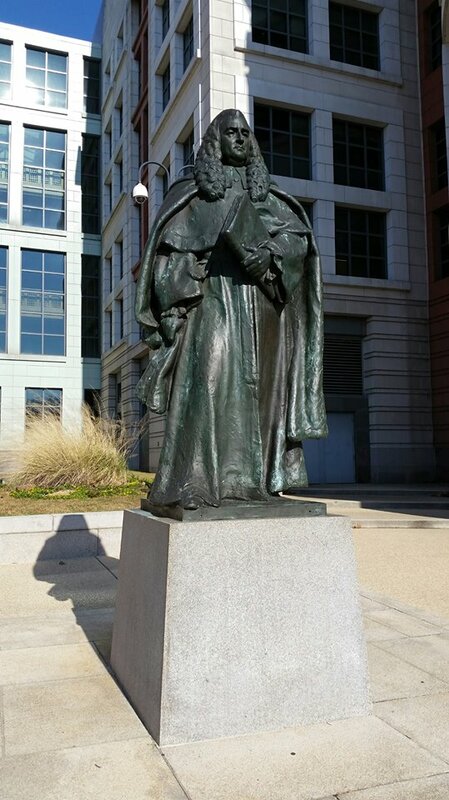 But I am back in the office now, and on my first outing of the new year I encountered a statue located in front of but off to the side near the United States Courthouse. 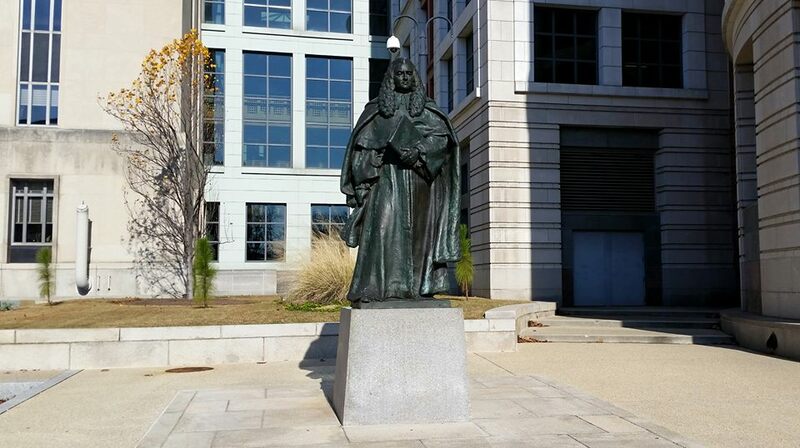 That statue is of William Blackstone, and like many of the statues and memorials here in D.C. it has an interesting backstory. Sir William Blackstone was an English jurist, judge and politician of the eighteenth century who is best known for writing a four-volume work on English law. These volumes, known as Blackstone’s Commentaries on the Laws of England, would not only dominate the common law legal system for more than a century, but also help shape America’s Declaration of Independence and Constitution, and have a substantial influence in American law. His Commentaries would also influence the likes of Alexander Hamilton, John Marshall, John Adams, and Abraham Lincoln. And to this day, his Commentaries still continue to be cited in Supreme Court decisions. In the early 1920’s the American Bar Association presented a sculpture of Blackstone to the English Bar Association. The gift, however, was too tall to be placed in the Royal Courts of Justice. The sculpture, designed by American artist Paul Wayland Bartlett, was later cast in Europe and the statue was presented back to the United States for display. 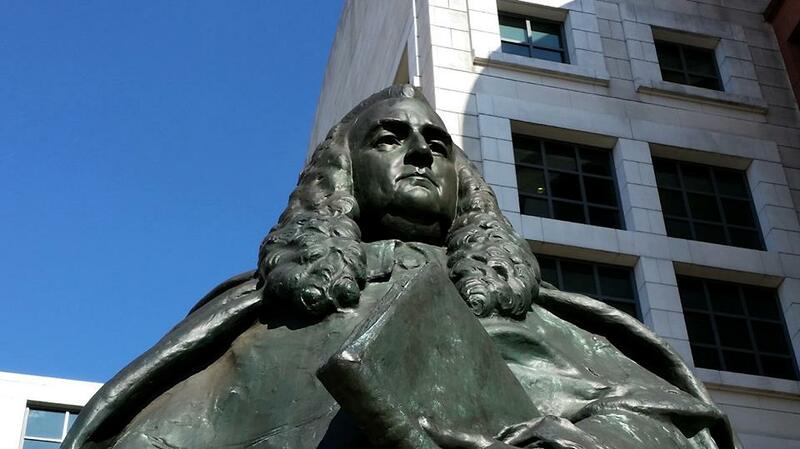 The bronze statue is a nine-foot standing portrait of Blackstone dressed in his judicial robes and long curly wig, and holding a copy of his legal publication entitled “Commentaries” in his left hand. It is elevated on a granite base. Congress approved the placement of the sculpture in 1943, and appropriated $10,000 for the installation. It was installed later that year under the authority of the National Park Service. The statue is on the grounds of the E. Barrett Prettyman United States Courthouse, at 333 Pennsylvania Avenue (MAP) in northwest D.C.’s Judiciary Square neighborhood. On this bike ride as I was riding east in the protected bike lanes on Pennsylvania Avenue between The White House and the U.S. Capitol Building, I happened to see a small plaque on the front of a building. Out of curiosity I circled back and stopped to see what it was. 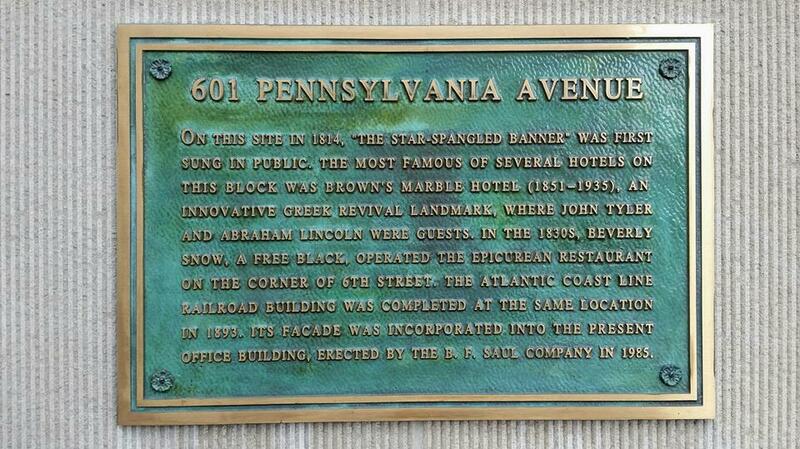 And as it turns out the plaque, located 601 Pennsylvania Avenue (MAP), commemorates the location where “The Star Spangled Banner” was sung in public for the first time. The Star-Spangled Banner” is the national anthem of the United States. It was recognized for official use by the United States Navy in 1889, and by President Woodrow Wilson in 1916. And it was made the national anthem by a Congressional resolution on March 3, 1931, which was signed by President Herbert Hoover. The song’s lyrics come from a poem entitled “Defence of Fort M’Henry”, which was written in September of 1814 by Francis Scott Key, who just a few block past the western end of Pennsylvania Avenue has a memorial park named after him. Key was inspired to write the poem by the sight of a large American flag flying above Fort McHenry during its bombardment by the British Royal Navy during the Battle of Baltimore in the War of 1812. The words were later set to the tune of a British song which was already popular in the United States entitled “To Anacreon in Heaven”, written by John Stafford Smith for the Anacreontic Society, a men’s social club in London. Despite the fact that the song is notoriously difficult for nonprofessionals to sing because of its wide range, The Star Spangled Banner today is traditionally sung most often at the beginning of many public sporting events in the United States, as well as other types of public gatherings. But on this bike ride, I discovered where the patriotic song was sung in public for the first time a little over two hundred years ago.